1. The original creation of the universe (sarga). 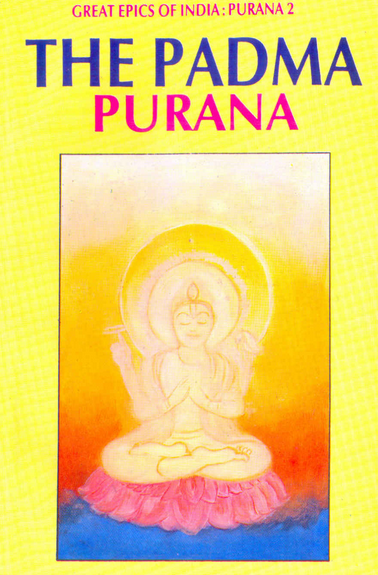 The Padma Purana is the second longest purana with fifty-five thousand couplets. The Padma purana is divided into sections – Srishti kanda, bhumi khanda, svarga khanda, patala khanda and Uttara khanda. The Padma Purana is a Sattvika Purana, as it glorifies Lord Vishnu. The Padma Purana has many stories and less facts, which makes it extremely interesting. Bibek Debroy starts the purana with the bhumi kanda. He usually starts the puranas with Lomaharshana narrating the Purana to a group of sages. There are many stories, most of them, which I enjoyed, but the best stories to me, are two of them. These stories come when you have finished about half of the whole book. They come during the story of Sage Chyavana. Sage Chyavana decides to go on a pilgrimage to visit all the tirthas, as he believed, if he visited them, he would attain true knowledge. On his journey, he stopped to rest under a banyan tree. The Banyan tree was the house to a family of parrots. The male and female parrot had four sons. Every day they would go to different places in search of food. Their names were Ujjvala, Samujjvala, Vijjvala and Kapinjala, respectively. On this particular day, they happened to visit places where strange sights met them. They would narrate their story, and ask their father Kunjala to explain the strange sights they saw. I enjoyed the stories of Samujjvala and Kapinjala. Samujjvala’s story: He went to the Himalayas to search for food, in one particular valley that was frequently visited by sages and apsaras. There was a lake called the Manasa sarovara. He waited there and several swans arrived. Some were black and the others were white. They were followed by fierce looking, ugly women. The black swans went to bathe. The women stood outside and laughed. A large white swan came out of the water followed by three swans. They took off, followed by the other white swans. Meanwhile a hunter arrived at the spot and sat down, followed by his wife. The wife didn’t recognize the husband, as he was better looking than before. The husband explained to her that he had bathed in the Narmada sangam, the meeting point of the rivers Narmada and Reva. He guided his wife there, and the swans with the women followed. The swans bathed, and the black swans became snow – white. The women when did so died. The explanation for this: Narada visited Indra in heaven. Indra questioned Narada about which of all the tirthas was the best. Narada was confused and couldn’t answer it so Indra summoned all the tirthas to his court. He posed a question to the tirthas that which one could purify the worst of sins. The tirthas suggested Prayaga, Varanasi, Pushkara and Arghyatirtha. There is a story connected to this. One day, a kshatriya named Vidura killed a brahmana in a fit of anger. This was a great sin, so he visited many tirthas, but his sin wasn’t forgiven. On his journey, he met a man named Chandrasharma. He had killed his teacher, and he too had visited many tirthas but his sin had not been forgiven. They decided to travel together. They met two more men, Vedasharma and Vanjula. One had married someone he should not have and the other was a drunkard. They journeyed together and a sage advised them to visit Prayaga, Arghyatirtha, Varanasi and Pushkara. They visited the tirthas and their sins were so bad that the tirthas became contaminated and followed the sinners in the form of black swans. The tirthas that were not contaminated followed the sinners in the form of white swans. The whole retinue went to the Manasa sarovara. This tirtha also took the form of a black swan and eventually made their way to the confluence of the rivers Narmada and Reva. When they bathed in this tirtha, they all were cleansed. The four women were the personifications of the four sins of the four women. When the sinners were pardoned, the sins died. The most sacred tirtha of all is the tirtha present at the confluence of the rivers Reva and Narmada, known as the Kubjatirtha. Kapinjala’s story: He went to Mount Kailasa in search of food. Near one particular pond, he saw a woman seated on a boulder crying. From her tears sprouted lotuses. A sage picked those lotuses and offered them to Lord Shiva. After doing this, he danced and then sat and cried. Explanation for this: There was an asura named Vihunda. He wanted to take revenge for his father’s death. He started doing a terrible tapasya. The gods were terrified and prayed to Vishnu. To help the gods, Vishnu took the form of a beautiful woman and distracted Vihunda. He fell hopelessly in love and asked Vishnu if he could marry her. Vishnu agreed and told Vihunda that first he would have to worship Shiva with seven crore Kamoda flowers, make a garland of them and give it to her. He agreed. He searched for Kamoda flowers but could not find them. His guru Sukracharya told him that Kamoda flowers didn’t grow on trees. They sprouted when a woman named Kamoda laughed, but when she cries, the flowers that emerge should not be touched. He told him where Kamoda could be found. The gods had no intention of allowing Vihunda to get the flowers. They told her that Vishnu was going to leave heaven and come down to Earth. The thought of Vishnu leaving heaven was so depressing that she started crying. Vihunda, not realizing that these were the flowers had sprouted from Kamoda’s crying, collected the flowers and worshipped Shiva. This act angered Parvati that she killed him. The rest of the Padma Purana has stories of how punya can be obtained by simply cleaning Vishnu’s idol or removing darkness from it. A person who hears just the recitation of one shloka of the Padma Purana is forgiven of all his sins he may commit in the space of a single day. A lot of punya is also obtained if one donates a thousand cows to a brahmana or if he hears the recitation of one chapter of the purana. In the Kali yuga, punya can be obtained by listening to the whole Padma Purana being recited, giving alms or doing tapasya.